Latrice Allen Won’t Run An Open Mic, But She’s Doing Just About Everything Else You Could Fit Into A Comedy Career. Latrice Allen started comedy before she was even old enough to smoke. Listen, I know we currently have an 11-year old tearing up stages here in DFW, but it’s worth making it clear that someone jumping into stand-up at even 17 years old is still impressive, and unusual. 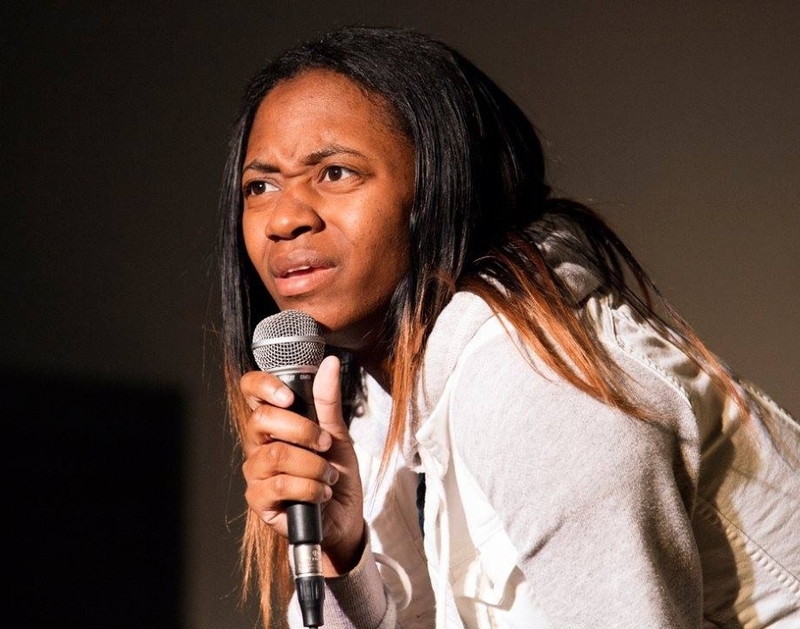 Allen started performing while in high school thanks to some encouragement from fellow comic Thomas Nichols, and it didn’t take long for her to win the respect of her peers and audiences alike. The clubs certainly took notice of her talent; she earned coveted feature opportunities with remarkable swiftness. Allen credits her early success to luck, but she has more than enough skill to justify the opportunities she’s received. Allen has a relaxed demeanor onstage, but her outward calm hides an incredibly quick wit. Audiences are lured in by seemingly common experiences, then hit with a flurry of wonderfully unpredictable turns. Charm and sharp writing helped her build a sterling reputation in DFW’s comedy scene, and helped her secure opportunities on the road. During our interview, I talked with the now-24-year-old Allen about how she’s looking to grow as a comic. In addition to expanding to more cities, she’s also looking for new opportunities to show off her skills as a writer. You can see her onstage this weekend at the Hyena’s Comedy Club in Plano. I’m catching you before a couple of shows tonight at Hyena’s in Fort Worth. You’re featuring tonight, correct? How long have you been featuring for the club? I want to say two-and-a-half years. How long did it take you to move to the feature level? It took a little while, but it was weird how I got moved up. Randy [Butler, the owner of Hyena’s] came to an open mic, and I happened to be going on next. He was like, “Cool, you’re opening.” I did that for maybe a year-and-a-half. Then came down and watched my set [during a weekend show] because Dustin [Ybarra] was doing a guest set, and he saw my set and said, “You’re a feature from now on.” I was stoked. If I’m not mistaken, that’s a little faster than most people move up. You’re chalking it up to luck? You had an interesting start in comedy – how old were you when you started? Can we talk about how you got into comedy? What was it like? I mean, obviously we have people in our scene starting younger than 17, but what’s it like being not even old enough to smoke and trying to impress adult crowds when you still have high school as your perspective at that point? I thought it was super exciting, actually, because at that young an age, you’re not really used to people listening to you when you speak. [Laughs.] So when I was talking, and everyone’s paying attention, and actually getting what you’re saying, and they think it’s funny? That’s a great feeling. I liked it. What’s it been like growing as a comic in Dallas? It has good and bad moments. I think the only downside is there’s a whole lot of comics here — like a lot — so you’ll get constantly booked for something, and then out of nowhere you’ll just drop out for like two months or whatever, because some other comics are starting to get more recognized. So your time between going up on stages can get spread out. But it’s a challenge, and it helps you grow. Is it weird that there are people in the scene who have this memory of you as technically still a kid? Yeah, a little bit. They don’t really bring it up a lot. But sometimes, like, Paul Varghese will be like, “Man, I remember you when you were a baby.” Yeah. Little Xs on my hands. It must’ve felt good when you were able to go in for the first time at 21 and not have to receive the Xs. Yeah. I actually forgot how old I was for a little while, because it was cool going in the clubs — they wouldn’t X my hands because they knew I wouldn’t drink. Plus, they were kind of watching me. But they knew I didn’t drink. And then, there was only one club, one show, where they put the biggest X possible on my hand, and I had to perform with these two big Xs on my hands. But, other than that, I didn’t really notice it. You’re performing on the road more lately, correct? I’m starting to get out more — traveling, flying places. It’s not necessarily from getting booked out there — sometimes I do get booked — but it’s also just going out there and going to clubs, or signing up for festivals, or going out of town and doing open mics, and [having] someone see you and say, “Oh, you’re from Texas? Well if I have a show, I’ll get you on out here.” People like out-of-town talent, because it brings something new and fresh to their scene. What motivated you to start traveling outward like that? I actually did a comedy festival in Atlanta, and it was super fun. I really liked it, and I met a lot of comics from different states, and everyone was really welcoming, like, “Yo, come where I live! I’ll get you on where I perform a lot.” That really helped motivate me. Before, [I was] kind of scared to go out: “Nobody knows me, they’re not going to care.” [Laughs.] But they’re pretty cool. Can we talk about your material a bit? How has it changed over time? I’ve experienced more stuff as an adult. When I started, I was illegal. [Laughs.] But then you grow up, move out the house, and your jokes start becoming more about adult stuff. Going from talking about parents to talking about yourself, and life. Do you feel like your subjects change the way you write or perform a joke? That’s actually a good question. I guess it does without you realizing it. I guess it depends on how it makes you feel. If I’m talking about relationships, and I’m going through a breakup at that point, it would probably be more of an angry joke. So outside of Dallas, where has your favorite place to perform been? Atlanta. I go to Atlanta a lot; my sister lives down there. So when I fly out, I have somewhere to stay for free. So it’s not that expensive. I just pay for the flight. What’s it been like performing out there? Super fun. I’ve made a lot of good friends, and every time I go down there, I get put in a room. It’s pretty fun. The scene is really good down there. You’d be surprised how many people go to a comedy show down there and really want to listen to comedy. It’s very nice. There was this 1 a.m. show I did down there, and it was sold out. It was packed in the room. It was a bar with two separate rooms — one for comedy, and one for bands. Everybody at the bar was waiting around like, “What time does the comedy show start?” They were waiting on it. And they were listening and laughing. That’s one thing that makes me sad about the scene here. It can feel really hard to put together an interesting, weirder show or trying that 1 a.m. slot. It would be interesting to do a midnight show, but it would be really tough to pull off. It’s hard to get a crowd out and have them attentive and ready for comedy. What do you think helps the Atlanta scene? I don’t know. I used to think it was the alcohol times, because that does affect comedy a lot. Do they close at 4 a.m.? Yeah, they’re 4 am. In Dallas, we cut off at 2, so usually around the time people stop drinking, they stop wanting to be out, because they stop having stuff to do. And it makes them want to get out earlier, and if they get out earlier, they’re already drunk and tired, so they don’t really want to go to a 1 a.m. show. I think the alcohol time has a lot to do with it, honestly. And then if you go to a show late at night, and it’s good the first time, and you want to go again. And then it won’t matter about the alcohol and stuff like that. Is there any one thing in Atlanta you could point to as something you’d really like to bring back to our scene? I don’t know. I feel like the comics… no, it’s about the same in Dallas. No, other than the crowds, not really. [Laughs.] I was about to say everyone in Atlanta’s good friends, but I was thinking about Dallas, and we’re all pretty good friends, too. Let’s talk a little bit more about the DFW comedy scene. What’s your take on it as it stands now? I think everybody’s cool with each other, and the friendship is the best between comics. We all kind of look out for each other and give each other advice, tags and stuff. Jokes. If I see you come offstage, I can say, “Oh, Alex, how about you try this?” or whatever. I think it’s pretty friendly. It does feel like, even if there’s someone I don’t know well, I can talk about that stuff with them. Yeah! We kind of look out for each other, put on shows, even just a little prize to get people out to open mics, get ’em working on material. I know you do challenges and stuff at your open mic. It was a way to liven things up. It does. It also hit this wall, where I get people from Fort Worth, and they don’t have nearly as many open mics, and I feel bad that there’s a rule in place where they can’t re-use material, because then they can’t hone material. Yeah, but you’re better than me, I don’t even have any open mics. Have you ever run an open mic since you’ve been doing comedy? No. I’ve seen people who run open mics… like, Linda [Stogner] strayed me away from it, because when I started, I started at Backdoor, and I’ve seen her put together a list, and have comics come up to her and talk to her all day, and I couldn’t do that. There’s so many needy people, and they’re all saying, “How long before I go on?” I can’t do it. I didn’t realize you’d started at Backdoor. Backdoor was the first open mic I ever went to. It’s been a while since I’ve been there. Since I’ve grown in comedy, I’ve become more long-winded. So I’m scared of going over. I don’t want to disrespect the mic. But I do the weekends there sometimes. Do you feel like you have a home club? It’d probably be Hyena’s. I think that’s most people’s home club. As far as the open mics, I would say it’s the Arlington Improv, but as far as shows and weekends, it’s pretty much Hyena’s. You mentioned going out for travel, and festivals. Is there anything else you’ve started doing lately? I’ve actually gone back to school and started taking writing classes. I want to be a writer. You know how when you do comedy, you have to do something else, like acting, or writing? So I want to do comedy and write. When did you start taking classes? I actually started a long time ago. I just started back up. I’m the kind of person where I don’t want to mess up my grades or anything, so if I get too busy, I kind of fall off and don’t sign up for classes. But I’m about to get my Associate’s. After my semester in the fall, I’ll have my associate [degree]. Is that something you’re going to push more once you have it? Yeah. I helped a guy with an independent film; I wrote for it a little bit. And that kind of really made me want to get back in school and do it. Has that been filmed already? It has. They’re still working on it, getting it ready to put out. It’s not going into theaters or nothing like that. It’s not super special, but it’s special enough. Can you give us any details on the plot? It’s kind of confusing. It’s called Highland Park, TX Hockey League. It’s a hockey movie, but it’s not a hockey movie. It has a few comedic scenes that I helped write, some comedy relief scenes. And I actually had a very small part in the movie. So when that comes out, I’m gonna put it everywhere. I have a best friend, and he’s like a director, and he writes a lot of plays – none of them have been put out, but he writes a lot. He sends them out, and hopes someone will back his production. He started talking to this guy, and told him about me. We got to talking, and that’s how it happened. So now you have the writing bug and the acting bug? Yeah. Way more comfortable with the writing, though. [Laughs.] Way more comfortable writing. I’m actually going to start a YouTube channel this year, and do a lot of sketches, reaction videos and stuff like that. A lot in store this year. I don’t know. Everybody else is doing resolutions, I figured I should probably do some. Ask me around March if I’m still working on these. [Laughs.] I’m also starting a diet, we’ll see if that finishes. I feel like interviewing people in January is a chance to hear a lot of plans. On that subject, what’s your biggest comedy goal for 2017? Stand-up-wise, I think it would be to sign up for more festivals, stay busier. And go back to open mics more — I kind of fell off. I need to go to more, get back into it. You’ll see me at your open mic. I’m gonna hold you to that – I’ll have it in writing now. Previous ArticleThings To Do On Thursday, January 19.